The index opened positive and went up to touch a new yearly high at 8711.30 but saw huge selling pressure to close flat at 8636.55, small loss of 1.95 points. The broader market was negative with 609 advances to 1009 declines. Range for the series stays at 8500-9000. 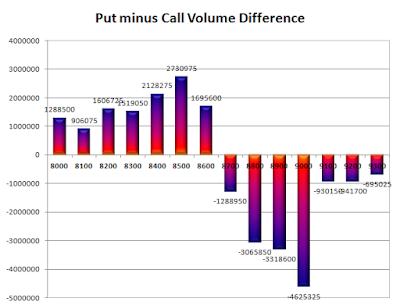 Call option 8700-9300 added 27.46 lacs OI with short covering at 8600 and below strike prices. Put option 8700-8000 added 18.37 lacs OI with small short covering at 8900 and above strike prices. 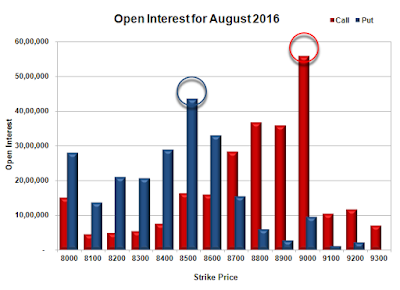 Nifty Open Interest is at 2,25,25,725 up by 3,49,575, with decrease in price, most probably short build-up. Bank Nifty Open Interest is at 18,89,720 up by 1,61,840, with decrease in price, most probably short build-up. 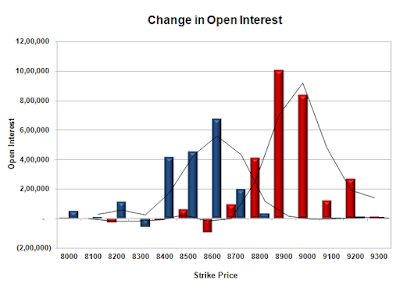 FII’s bought 9860 contracts of Index Futures, which includes net 9032 contracts long build-up and 828 contracts short covering, with increase in net OI by 8204 contracts, includes 38131 longs to 28271 shorts for the day. FII’s Index future open contract as on date is 260640 Longs to 33036 Shorts, Net long 227604 contracts. Initial support at 8600, with OI of 32.92 lacs and below that at 8500 with OI of 43.59 lacs. Initial resistance at 8700, with OI of 28.29 lacs and above that at 8800 with OI of 36,71 lacs. Day Range as per Option Table is 8586 - 8702 and as per VIX is 8569 - 8704 with 8646 as the Pivot.